A good day on the water means having fun and being safe. A great day on the water means catching a bunch of fish too. But what happens when you can't find the fish to make your good days into something great? Thanks to a long standing collaboration at Pymatuning Reservoir in Ashtabula County, anglers who fish this lake have a chance to turn their good fishing trips into great trips that they can remember for a lifetime. 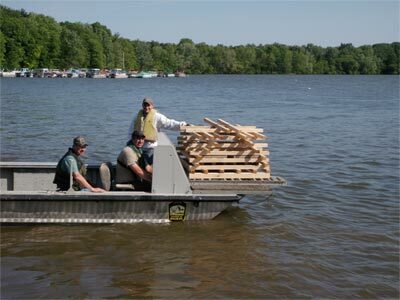 This past week, the Ohio Division of Wildlife teamed up with the Pennsylvania Fish and Boat Commission, the Pymatuning Lake Association, Ohio State Parks, and the Pennsylvania Department of Conservation and Natural Resources to place structure into Ohio's largest inland lake. "The wood structures that we introduced imitate the old stumps that have degraded away over the years," says Matt Wolfe, fisheries biologist who oversees this project for the Division of Wildlife. "If anglers can find these structures, their chances of locating and catching fish increase significantly," added Wolfe. Wooden crib structures were placed at two different locations in the lake. On the east side, 36 structures were placed in about 10 - 12 feet of water. The center of the reef can be found at N 41o 35' 50.8" / W 80o 30' 35.1". On the west side, 64 structures were placed in about 6 - 12 feet of water. The center of the reef can be found at N 41o 35' 49.2" / W 80o 32' 0.2". Both sites are about 2/3 of a mile south of the main causeway. The map datum on your GPS unit should be set at NAD 83 to find the structures and the coordinates provided are in degrees, minutes, and seconds. The goal of this project is to introduce 500 structures into the waters of Northeastern Ohio annually in order to recruit the next generation of anglers and retain the anglers who already enjoy the sport of fishing. A downloadable Google Earth file containing all of the structure placements throughout Northeast Ohio is available by contacting the Wildlife District Three office. For all other inquiries, please contact the Wildlife District Three office in Akron at (330) 644-2293.